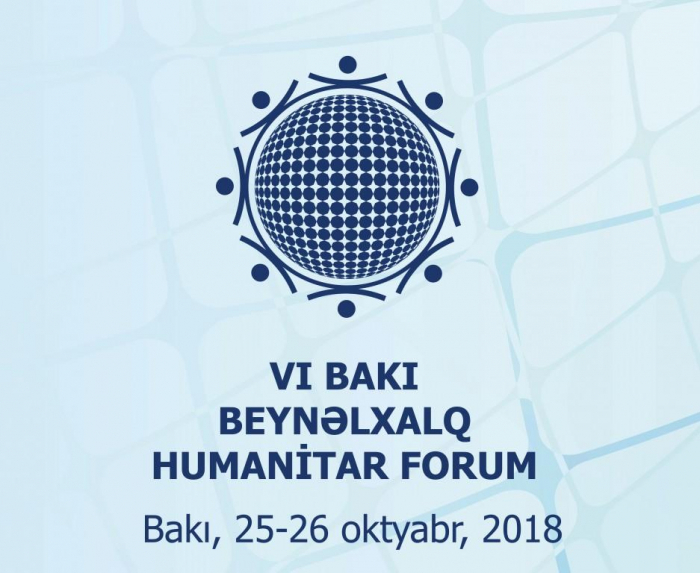 The VI International Humanitarian Forum is due to kick off in Baku on Oct.25. The VI Forum is dedicated to the topic Shaping a New World and a New Humanity: Creativity and Human Development. Quite interesting plenary and working sessions will be organized on this topic. The main topic of the forum should be perceived as support for the human capital development policy of Azerbaijan. The forum's topic will allow demonstrating at the national and international level the country's model and strategy for turning economic development into human capital. Around 581 people will participate in this two-day forum, including 416 foreign guests from 86 countries and 24 international organizations. The International Humanitarian Forum is a prestigious event that brings together prominent statesmen from various countries, Nobel Prize winners in various fields of science and leaders of reputable international organizations, including representatives of the political, scientific and cultural elite of the world to hold wide-ranging dialogues, exchange views and hold discussions on global issues. The main goal set by representatives of the world cultural elite, being the organizers and participants of the forum, is to shape a new humanitarian agenda in the fields of natural, social and human sciences with a goal of considering it in the future at international level. Within two days, officials, representatives of international organizations, as well as specialists in the above-mentioned areas will consider ways to address actual issues of concern to humanity. The initiators of the forum, which has been held since 2010, are the presidents of Azerbaijan and Russia. The forum will be attended by two deputy secretaries-general of the UN, deputy heads of organizations such as ISESCO, IRCICA, TurkPA, TURKSOY, the Black Sea Economic Cooperation Organization (BSEC), the International Turkic Academy (TWESCO), the Inter-Parliamentary Union (IPU), the UN Economic and Social Council ( ECOSOC), UNESCO, Executive Committee of the CIS. The event will also be attended by the Vice-President of Sudan, the Deputy Prime Ministers of Russia and Slovakia, the chairmen and deputy chairmen of Slovenia, Uruguay, Russia, Egypt, Belarus, Italy and Estonia, the ministers and deputy ministers of Georgia, Montenegro, Uzbekistan, Bulgaria, Turkey, Sudan, Tajikistan, Kazakhstan, Ukraine, Afghanistan, the Philippines and Bulgaria, ombudsmen from Kazakhstan, Turkey, Tajikistan and Uzbekistan, as well as more than 40 MPs from 15 countries, heads of diplomatic missions of 46 countries, heads of companies, scientists and experts. A varied cultural program will be presented to organize leisure activities for participants in the framework of the International Humanitarian Forum, and guests' walks will be organized to explore the sights of Baku.